Dengue is a major public health and medical problem throughout the world and is transmitted by mosquitoes. Approximately 400 million people are estimated to be infected by dengue viruses every year resulting in ~100 million debilitating disease cases (dengue fever, dengue hemorrhagic fever or dengue shock syndrome) (Bhatt et al., 2013). Because there are no specific drugs to prevent or treat dengue, and vaccine development remains a challenge, disease prevention has been left primarily to public health agencies, which are expected to deploy technologies that protect entire communities. Current strategies rely on preventing contact between people and the mosquito species (vectors), primarily Aedes aegypti, responsible for spreading dengue. This is achieved largely through the use of broad-spectrum insecticides to reduce the number of adult female mosquitoes (male mosquitoes do not feed on blood and do not transmit the viruses). However, insecticide use by itself has been inadequate for solving the problem in most circumstances and operational factors challenge many control efforts (Horstick et al., 2010). Furthermore, widespread use of insecticides can be expensive and have undesirable environmental consequences. We proposed to develop and test cost-effective, genetics-based technologies that would provide tangible public-health benefits while having minimal off-target consequences. We used genetic-engineering approaches to generate mosquitoes with the purpose of controlling virus transmission. These strategies seek to eliminate or reduce mosquito densities below transmission thresholds (suppression) or make them refractory to virus infection (replacement/modification) The project goals were to develop working prototype strains, test them, and if they meet risk assessment and performance criteria, develop ways of making the resulting strains available for public benefit. New technologies for global public health stimulate discussion of the role of the affected communities in the research and what they can expect in exchange for their participation. These discussions are especially challenging for novel technologies for which risk assessment, regulatory requirements and product roll-out procedures have yet to be developed. We developed a multifaceted approach in the project that would further the development of evidenced-based risk assessment and the application of ethical regulatory and social practices as part of a phased testing of the genetically-engineered mosquito strains. We realized from the outset of the project that stringent site-selection criteria would be needed to identify collaborating institutions in dengue-endemic countries. In addition to a number of scientific requirements, we needed to be able to engage a fully-functional regulatory system as well as extant public health systems and dengue-control program structures. We also needed access to historical and current vector and disease epidemiological data, and recognized that we would have to develop community engagement activities that would lead to support for the research and establish practices for ethical conduct of the studies. Unlike drugs, vaccines or insecticides, no previously-established pathways for product discovery, development and delivery existed for the application of genetically-engineered mosquitoes to controlling dengue virus transmission. It was incumbent on project participants to both be advocates for the development of the technologies while at the same time help to develop the systems that would ensure their safe, transparent and lawful testing. Thus, the need was critical to identify potential trial sites where we could work cooperatively with stakeholders to develop the social and regulatory systems as well as the science. Our initial site-selection practices are documented in a publication (Lavery et al., 2008) that outlined the principles that ultimately led to the selection of the Instituto Nacional de Salud Pública (INSP) and its subsidiary, Centro Regional de Investigación en Salud Pública (CRISP), in Mexico as a full partner in the endeavor. The site criteria continued to be developed throughout the project in response to our progress and we published a summary guide that we expect will help other researchers as they weigh options for selecting sites for field research (Brown et al., 2014). Criteria were developed in four categories, Scientific, Regulatory, Community Engagement and Resources. The criteria were derived from published material, discussions and personal experiences with the expectation of providing guidance to laboratory scientists for addressing the conceptual and operational considerations for identifying partner researchers and countries with whom and which to collaborate. We hypothesized that we could reduce significantly dengue transmission to humans by reducing mosquito population sizes. An Ae. aegypti strain, designated OX3604C, was engineered with a gene that allows female mosquitoes to grow and reproduce normally under laboratory/manufacturing conditions but is essentially lethal when these mosquitoes are in the wild (Fu et al., 2010). The approach is called 'female-specific Release of Insects carrying a Dominant Lethal' (fsRIDL). More precisely, this gene produces a phenotype whereby female mosquitoes are unable to fly but males carrying the gene are normal and capable of flight. Released, engineered males mate with wild females and the resulting female progeny cannot fly. Females that cannot fly in the wild cannot feed on blood or transmit disease, and also cannot mate. These engineered strains permit male-only releases ('genetic sexing') and enable the release of eggs instead of adults, features that are important for product shelf-life, logistics, costs and end-user approval. Trials of this technology were carried out first in large laboratory cages at Colorado State University (Wise de Valdez et al., 2011). 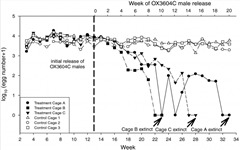 OX3604C males introduced weekly at initial ratios of ~10:1 into cages containing wild-type mosquitoes eliminated the populations within 10-20 weeks. We next scaled up to large outdoor field enclosures in a dengue-endemic region in southern Mexico (Facchinelli et al., 2013). Here we observed that although OX3604C was able to impact the target population, the predicted time to population suppression was at least two-fold longer than what was seen in the laboratory cage trials. The reasons for this are unclear, but a mating disadvantage in OX3604C males when compared to wild-type males may have contributed to the observed outcome. This disadvantage would not have been measured or recognized in an open-filed trial and this argues for these types of cage trails to be a part of the phased product evaluation along with continuous studies of local vector population dynamics. We expect that a strain carrying the same engineered gene but without the mating disadvantage could prove to be effective in large-scale releases. Furthermore, this strategy and engineering design is not limited to just Ae. aegypti or dengue. We demonstrated the general applicability of the approach by developing female-flightless strains of Anopheles stephensi, a mosquito species responsible for transmitting malaria in the Indian subcontinent (Marinotti et al., 2013). Research in support of the field experiments resulted in the development of semi-field cage systems for contained trials with Ae. aegypti (Facchinelli et al., 2011), important new data on dispersal patterns of male mosquitoes for use in the design and evaluation of genetic control programs (Valerio et al., 2012), and the procedures for colonizing wild-derived mosquitoes to optimize genetic diversity (Wise de Valdez et al., 2011; Facchinelli et al., 2013). Long-term, sustainable genetic control requires the deployment of strategies designed to be resilient to the immigration of susceptible mosquitoes and dengue-infected people. Strains for population replacement have the appropriate performance features for this purpose. Wild mosquitoes immigrating into a region populated by engineered, virus-resistant mosquitoes will acquire the gene by mating with the local insects, and persons with dengue moving into the same region will not be able to infect the resident vectors, and therefore are not a source for infection of other people. Furthermore, this approach shares with other strategies the advantage of using male mosquitoes to find females, which is expected to offer access to vector populations that would be unreachable using conventional tools. Research in mosquitoes that transmit malaria supported a strategy of targeting resistance in multiple mosquito organs; in this case the midgut (stomach) and hemolymph (fluid component of the circulatory system) (Isaacs et al., 2012). This approach offers the opportunity to target pathogens at multiple stages in their infection cycle, thereby increasing the efficiency as well as providing additional barriers to the ability of the pathogens to develop resistance to the effector molecules. Work done previous to the project was able to show that it is possible to produce a strain of mosquitoes incapable of transmitting dengue 2 virus by directing an endogenous, natural antiviral immunity pathway, RNA interference (RNAi), in the midgut (Franz et al., 2006). This work demonstrated the proof-of-principle for this type of anti-virus effector gene. More recently, a strain was developed that carries a gene that results in no secreted in mosquito saliva and no significant fitness load (Franz et al., 2014). The adult female salivary glands also are a desirable target to block dengue transmission to human hosts. We developed engineered mosquito strains that target expression of the previously-developed RNAi-based effector molecule in the vector salivary glands (Mathur et al., 2010). These lines were able to reduce dengue virus infections in the mosquitoes (more specifically, they reduced significantly the prevalence and mean intensities of viral infection in mosquito salivary glands and saliva) and together with the midgut-targeting genes are expected to provide a complete barrier to virus transmission. The majority of published reports support the logic that an anti-pathogen gene (such as an RNAi construct) would need to be coupled with a selfish genetic element in order to drive it into a target population to replace the existing genotype. Laboratory work by our group and others to develop gene-driving systems has resulted so far in only limited success. We hypothesized that we could use two constructs that we had already developed to add an anti-viral gene to an Ae. aegypti population without use of an accompanying drive mechanism. We developed mathematical models to ask what would happen if we built a mosquito strain that had a conditional female-lethality construct on one chromosome (for example, the one that produces the flightless-female phenotype) and an anti-dengue RNAi construct on a separate, independently segregating chromosome. This strategy has been designated 'Reduce and Replace" (R&R). Results from a non-spatial, deterministic model with parameters reflecting Aedes population biology indicated that such a strain could result in near fixation for a short period of time of the anti-dengue genotype with substantially fewer released mosquitoes (~10%) than needed for population suppression (Robert et al., 2013). Furthermore, if the construct did not have a fitness cost, the replacement could be permanent. Small intermittent releases would be needed to keep a high frequency of non-transmitting mosquitoes if there were a fitness cost. A more detailed spatially-explicit, stochastic model had less optimistic predictions, but still indicated that R&R would be more efficient than the population suppression approach on its own (Okamoto et al., 2013). Further analysis with the deterministic and stochastic models revealed the counterintuitive result that repeated releases of mosquitoes that carried only the anti-viral gene would result in more efficient replacement than R&R(Okamoto et al., 2014). Careful examination of these finding indicated that even if the two chromosomes segregated independently, once the population size became small there would still be enough linkage disequilibrium between the construct causing female lethality and the anti-dengue construct to interfere with replacement. Based on the modeling results, we developed an experimental design to empirically assess these theoretical predictions. Concerns were expressed early and often by both scientific and lay communities that it would not be possible to garner the necessary approvals and support for testing and deploying these novel technologies. The novel technologies fostered the development and maturation of social and regulatory pathways that inform the decision-making on feasibility, safety, efficacy and acceptability of the genetic strategies being advanced, and at the same time, the development of standard operating procedures to ensure technical and ethical attention to risk assessment components. A series of national and international collaborative efforts attempted to frame the principles that would need to be addressed by policy- and decision-makers (Alphey et al., 2002; Scott et al., 2002; Benedict et al., 2003; Pew Initiative, 2004; Benedict et al., 2008; WHO 2010, 2014 ). It was therefore incumbent on us to address the principles that would be adapted and serve as guides for the ethical use of this technology in the development of regulatory pathways. We addressed the regulatory challenges associated with testing the OX3604C strain in contained field trials in southwestern Mexico (Ramsey et al. 2014). Our efforts were expedited by the presence of three critical regulatory and community features, the combination of which was unique to Mexico at the time our project was initiated. The first was the existence of a federal-level body that oversees the coordinated technical review of the proposed research by all secretariats and agencies expected to have some authority in the process. The benefit to the project from such a structure was that there was a single, defined body with appropriate expertise to which we could communicate regarding the experimental trials and through one of the constituent agencies receive the necessary registration and review. The second major factor was the presence of a world-class collaborative scientific institution, INSP and its on-site regional center, CRISP, which contributed the expertise, scientists, outreach experience and management that were essential for coordinating testing of this new technology. They also provided the technical and ethical scope of review that was essential for institutional review boards (IRBs), institutional biosafety committees (IBCs) and animal care and use committees. Special provisions applied by INSP for this Project included coordinated discussions of procedures and the addition of an oversight committee established by the Director General of INSP. These structures contributed at all levels to the assurance that issues with genetic engineering and ethical engagement of communities were addressed satisfactorily. The third critical factor arose out of the Mexican agrarian reform, current modifications of original landholding laws and the collective decision-making processes of the asamblea ejidal structure. One of the primary impacts of the 1910 Mexican Revolution was to return some decision-making regarding territorial issues to those who worked and lived on the land. The resulting reform linked land use and ownership with community decision-making in collectively-administered ejidos. Recent secondary land reform provides the opportunity for collectively-owned ejidos to permit land privatization and sale, and this has contributed to a recent shift from total collective ownership to privatization. The asamblea ejidal is considered in many rural communities to be the key community regulatory body. Community approval was necessary for INSP to acquire land for the cage trials, and part of the deliberative process prior to granting permission was for INSP and the project to communicate its intentions for initial as well as potential future use. 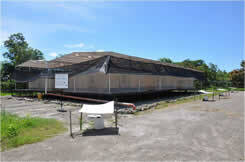 Thus, the asamblea ejidal was an integrating entity for all regulatory components at the local level. Importantly, their permission to sell the land was taken as an explicit approval for project activities. We were aware at the beginning of the project that we needed to develop a process for gaining community consent and validating the adoption and application of ethical practices and standards in the process of doing so. Remarkably, no explicit body of community engagement knowledge existed at the start of the project from which we could derive guidance about approaches that are most likely to be effective in different contexts, and why they may be so. Indeed, we lacked an operational definition of ‘community’. We developed a framework to provide a starting point for broader discussions of community engagement in global health research, particularly as it relates to the development, evaluation and application of new technologies and this was used to guide our efforts in Mexico (Lavery et al. 2010).